Baby pink color always looks cute and pretty. 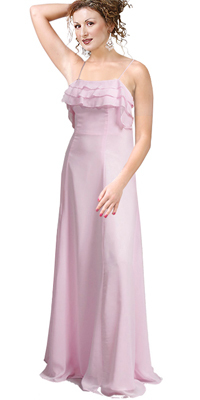 This dress is in the same color with some exciting features. The spaghetti straps and the bust that is ruffled in layers and the floor length dress looks amazing. The frills can also be seen at the back. With frills the whole look changes to flirty and fun-filled.